Companies that anticipate a long presence in the energy market are those involved with oilfield services. Companies that anticipate a long presence in the energy market are those involved with oilfield services. It's now January of 2008, and it's an understatement to say that the stock market is uncertain. To add to the general anxiety caused by the collapse of the housing market, oil prices keep going up. Since demand continues to rise, and production is falling off, high prices aren't going to end soon. With all this uncertainty, even healthy and profitable businesses are experiencing a temporary loss in stock value, which include the oilfield services companies. 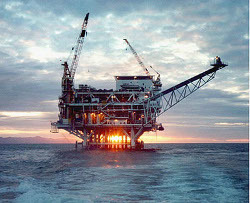 These companies provide a wide range of technology and project management, contracting with international oil companies, independent oil and gas companies, and national oil companies for building new oil rigs, both on and off-shore, as well as finding new prospects and providing reservoir management. Within recent years, they have become the companies developing new technologies, rather than Big Oil. These technologies include reservoir imaging, monitoring, and development, with seismic crews and data processing centers using seismic libraries. Imaging services range from 3D and time-lapse (4D) seismic surveys to cutting-edge surveys for finding new oil prospects. There's been speculation that the Big Oil companies have stopped spending money looking for new oil, since there's not much left, and they wouldn't be able to control it as in the good old days. Rather, they're spending huge amounts of money buying up the shares of their own companies, in order to have future control of the oil reserves they still own. Also unlike the Big Oil companies, oilfield services companies don't insist on owning a big share of the oil reservoirs they find, but only on getting paid for the work that they do. Because of this, they are the go-to companies for countries who want to control their own oil and economies. Companies like Schlumberger Ltd. have become popular with third world countries, because part of their contract is to train future executives and workers within the local population, which they are doing successfully throughout the world. There's a variety of viable oilfield services companies for investors to concentrate on, and it would be worth their while to investigate them.